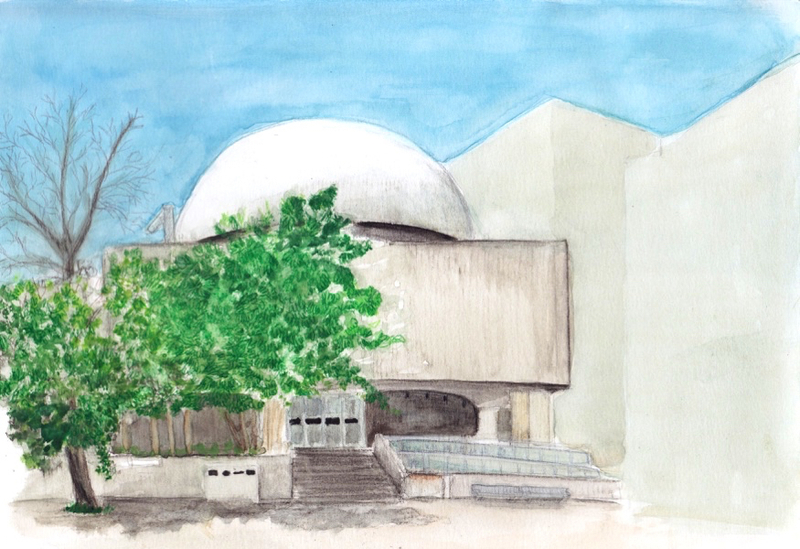 Nestled between the Royal Ontario Museum and Falconer Hall, the Toronto McLaughlin Planetarium is awaiting its demolition sentence. This unique building with a spherical roof opened its door to the public in 1968 with what was once state-of-the-art equipments to educate people about space. Now it serves as a temporary office space and a storage facility. It's very unfortunate that there doesn't seem to be any effort put into preserving and effectively using such a unique and important building. The McLaughlin Planetarium is apparently one of only ten planetarium in Canada. With all the available technologies and interests for arts and science in the city, it's difficult to understand why no one has found a way to put it to better use, specially considering the fact that it's in a prime location where other museums are within walking distance. As a way to essentially preserve part of the history of the city, I organized a sketching session with members of the Toronto Urban Sketchers group this weekend to capture the building before it is gone for good. The sketches from this building as well as other disappearing landmarks, will be part of an illustrated book we're currently working on. You can see more sketches from our session here.